Securitas UK has today announced it has been awarded Business Superbrands status for 2019, its second consecutive year. The Business Superbrands survey tracks the perception of a wide range of UK business brands, evaluating almost 1,600 brands across 63 categories this year alone. 2,500 UK business professionals, supplemented by an expert council of senior business-to-business marketing leaders, judge the business brands against the three core Superbrand factors: quality, reliability and distinction. Brand perception, marketing activities and new product and service developments, are also considered by the judges and only the most highly-regarded brands from each category are awarded Superbrand status. 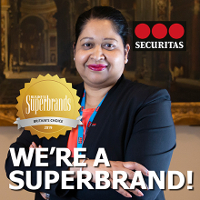 Brian Riis Nielsen, Country President of Securitas UK, commented: “We are delighted to achieve Superbrand status for the second year running. Securitas continues to lead the transformation of the security industry, delivering risk-based security and fire safety solutions that are continually evolving to meet our clients’ needs. “Securitas’ brand purpose is the promise we make to our clients to keep their people, property and assets safe. This promise, combined with our core values of integrity, vigilance and helpfulness, contributes to a safer society and is shaping the security of tomorrow. “From our on-site, mobile and remote security officers who are our brand ambassadors at client sites, to our dedicated teams in different functions across the business, our recognition as a Superbrand is the result of all their hard work and commitment. Stephen Cheliotis, CEO of The Centre for Brand Analysis (TCBA) and Chairman of Superbrands comments: “In unsettled times, businesses that are well-regarded and possess a positive reputation benefit from a competitive advantage over weaker branded rivals, providing greater immunity against short-term market volatility.